Many new moms develop unexpected allergies, during pregnancy or after baby is born. These can be rather annoying when you have a baby to care for as well as yourself. If you are breastfeeding it is vital you eat enough calcium to keep producing milk and keep yourself healthy. 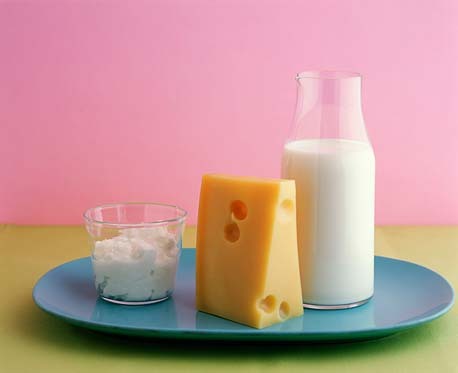 The most common unexpected allergy is lactose intolerance. You may find that suddenly you cannot eat dairy without some mild to severe side effects. Here are some tips on fixing your favourite dishes to be tolerable to your new digestive system, and healthier and tasty too. Many dairy products can be directly substituted for another. If you find yourself lactose intolerant then you can use soy milk, almond milk, lactose free cows milk, rice or oat milk. These are all readily available in the long life milk section of a supermarket. There is even hazelnut, quinoa, barley and other milks available at health food shops. You may also want to try fresh goat milk, unhomogenised cows milk, A2 cows milk or sheep’s milk. Unhomogenised milk has not been broken down on a molecular level to make the fat particles smaller – so they don’t ‘rise to the top’. In homogenised milk all the other particles (proteins, sugars etc.) in the milk are coated with these smaller fat particles. The fat particles are smaller than your body expects them to be. This makes homogenised milk harder to digest. Many supermarkets carry an organic unhomogenised milk in full cream and low fat. You will notice the cream clings to the top of the carton. The milk is not curdled, it is simply how milk aught to and used to be. Unpasteurised milk is illegal to sell for human consumption in Australia. Unpasteurised means the milk has not been heat treated. Even unhomogenised milk is pasteurised. Having said that, many health food shops sell unpasteurised milk as ‘bath milk’. But the intent really is for people to drink it. The natural bacteria from the cow are still present, making it even closer to nature and easier to digest – but it has a much shorter use by. Goats milk takes more getting used to, as does oat or rice milk. The best soy milks are Bonsoy and ‘Australia’s Own’ brand. Bonsoy is a Japanese soy milk that is a bit more expensive but the best tasting. If you try one brand and do not like it, you may find you like a different brand of the same type of milk. You don’t have to waste the whole carton: try it in tea, coffee or as custard. Different milks will taste better or different in different applications. You may like almond milk in your tea but only rice or soy in your coffee. Its all personal preference. Eating live ‘abc’ bacteria also helps digest the lactose in dairy. So try eating a good quality live yoghurt. There are lovely, very, very mild, sheep yoghurts available. There are also coconut or soy yoghurts if you find the bacteria alone is not enough to help your digestion. When it comes to cream: almond or cashew cream are the best in taste, texture and health. There are also soy or rice based creams from health food stores. You can even get soy cream in a can, to squirt out ready whipped! Cheese is also easy to replace. Try a mild sheep milk cheese like Manchego or fresh goats cheese like chèvre before you give up dairy all together. Long aged cheeses like cloth matured cheddar and parmesan cheese are also easier to digest, as the cultures that make the cheese eventually eat the lactose after the long maturation (some parmesan is matured for 30 months!). There are also delicious soy cheeses available, many are best if melted or cooked with. As your palate changes you will like them more and more – but if you don’t like one then try another brand and you may be surprised how different it is. There are also recipes online for making your own nut milks, creams and even nut cheese! Using nut based milks and creams means you are eating healthy nut fats, fibre, extra protein and some calcium as well as other trace minerals. As for your favourite recipes. Once you find a milk, cream and cheese you like: simply substitute! When you cook a dish the first time with a dairy substitute take extra care and take note of what you did and how it worked. Then you can repeat if a complete success or alter the next time. Next week I will share with you some simple recipes I have tried and tested, and found delicious! If you have a recipe request, simply ask in the comments and I will try to help! Tags: allergy, dairy, lactose, pregnancy. Bookmark the permalink.